aACE’s document management system is great for storing files directly in aACE, but if you’re in a creative or an engineering environment, you may need to keep files on your shared company server where colleagues who aren’t aACE users can access them. Wouldn’t it be great if you could access those server files directly from the relevant records in your ERP solution? aACE’s File Server Folder Launcher feature allows you to keep files organized on your company server while making it easy to access the folders you need directly from the relevant Lead, Project, Order, or Job record in aACE. Let’s take a look at how it works. Now that you’ve seen this feature in action, let’s walk through how one company uses it in their day-to-day operations. Our sample company, aACME Educational Services, publishes educational resources and programs for students, teachers, and school administrators. They’ve just received an order for a School Spirit Week science workshop from the Full STEAM Charter School (FSCS). As part of the order, FSCS has asked for custom signage and curricular materials to promote the school’s astronomy program. aACME’s graphic designers are not aACE users, so all of their work stays on the company shared drive. Account manager Mara Harvey sends drafts to the client and passes their feedback on to the creative team. Because aACME offers workshops like this regularly, they have a template set up with their standard workflow. Mara starts by opening the order’s record in aACE. From the Actions menu, she selects “Reveal File Server Folder”. 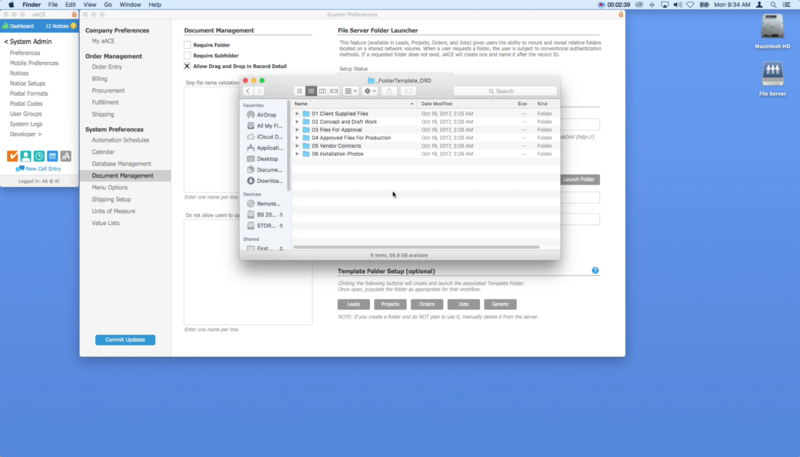 This creates a new folder on her shared drive that’s pre-populated with the subfolders she and her colleagues use to keep their files organized. When Mara follows up with FSCS, she can easily access all of the files related to their order right from her aACE solution – ensuring she has everything she needs close at hand. If you’d like to know more about this feature or discuss what else aACE can do for you, contact us today to learn more.